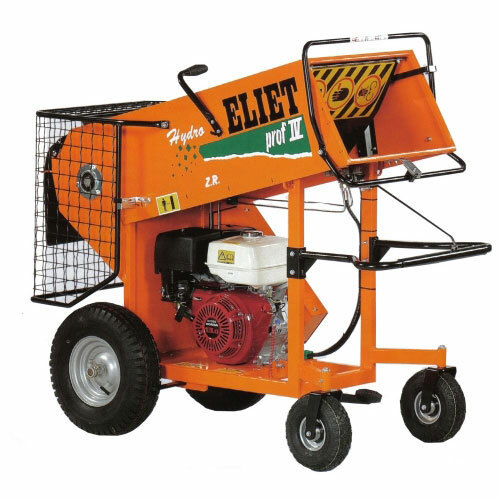 The Eliet Major PROF 5 is powered by a top quality Honda GX390 13.0hp OHV Commercial Grade Engine and is aimed at the demanding homeowner or professional user who wants a powerful machine to use all year round. The feed hopper is designed to shred timber with a diameter of 80mm and has an integral guide funnel that guides the waste into the hopper without the risk of blocking. Fitted with 24 razor-sharp blades which are reversable so that they will last twice as long, are designed to chop all kinds of waste from wood, green material, leaves and hedgecuttings. The unique Eliet chopping technology chops wood with the grain, allowing the blades to chop fine wood chips resulting in fine mulch for your garden. Other features include 4 heavy duty transport wheels, with large pneumatic tyres for easy transportation. Also available as an optional extra is a hydraulic feed roller, which significantly reduces the output of the machine. A hydraulic wheel drive system available for contractors who need to move the shredder on difficult or hilly terrain. Cutting Diameter: 80mm / 3.2"